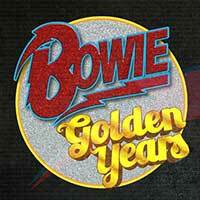 David Bowie's original band members are touring Australia and New Zealand in May. David Bowie's final project - the theatre production Lazarus - is coming to Melbourne this year. Parlophone will release a rarities set titled Spying Through a Keyhole. 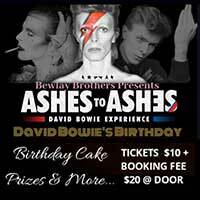 BOWIE UNZIPPED featuring Jeff Duff play shows in some interesting Melbiourne venues. Friday April 26 is at Frankston Music Fesival's Gala opening night. Saturday April 27 is at The Fawkner Music Club. Sunday April 28 is Sooki Lounge in Belgrave. 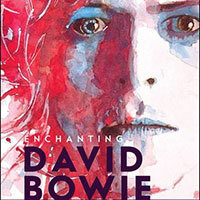 Celebrating the one and only Starman, Mr David Bowie. FEATURING: Kylie Auldist MANTRA, Chrissie Aubry (BATZ), Sean M Whelan, Emilie Zoey Baker, Ben Mastwyk, Jules Sheldon, Jac Beth, The David Bowie Dancers, The Spiders From Westgarth and Moogy Morgan. PLUS some extra special surprises still to be announced! TICKETS $15 ONLINE AND $20 ON THE DOOR. 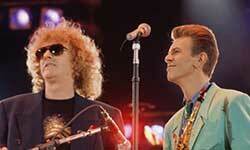 MARK PLATI (David Bowie's guitarist, bassist and producer from 1997-2002). The 2019 Head On Photo Festival will feature 12 international award-winning photographers. 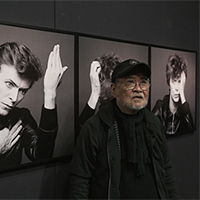 Among these is renowned Japanese artist Masayoshi Sukita – who photographed David Bowie and numerous iconic musicians for more than 40 years. Sukita's David Bowie features a series of iconic portraits of David Bowie, Iggy Pop and more. Jeff Duff presents a performance of Lou Reed's masterpiece album 'TRANSFORMER' plus a raunchy set of Lou Reed & Velvet Underground and Iggy Pop Classics. This first show takes place at The Caravan Club on the Saturday night. Jeff Duff presents a performance of Lou Reed's masterpiece album album 'TRANSFORMER' plus a raunchy set of Lou Reed & Velvet Underground and Iggy Pop Classics. This second show again takes place at The Caravan Club but as a late afternoon show on the Sunday. 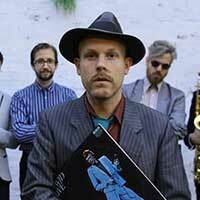 JEFF DUFF and band play an all ages show in The Casula Powerhouse Arts Centre. David Bowie's last ever project - LAZARUS - will be staged in MELBOURNE next year - the first city in the Southern Hemisphere to get the production. 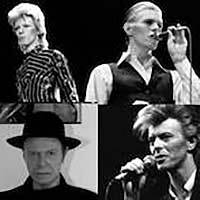 A punk rock phenomenon and a bewlay brother of David Bowie will be playing Melbourne's Festival Hall on his SEVENTY SECOND BIRTHDAY. 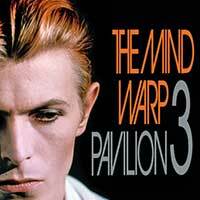 Boom Crash Opera's Dale Ryder, Taxiride's Jason Singh and Tim Watson and Electric Mary's Rusty have teamed up to deliver a musical extravaganza paying homage to David Bowie. 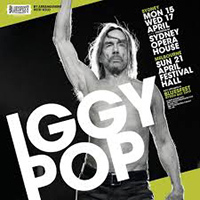 A punk rock phenomenon and a bewlay brother of David Bowie returns to Australia. He plays Sydney Opera House over two nights. JEFF DUFF and band play an all ages show in West Rhyde. Adam Rudegeair and band return to The Paris Cat to deliever their favourites from Bowie's vast catalogue as intense and swinging instrumental jazz! The Thin White Ukes will be delivering an intimate show as well as a uke workshop in a beautiful rural location a couple hoiurs north of Melbourne CBD. The Guatemalan singer who blitzed Sydney Opera House during 'Celebrating David Bowie' - is coming back to Australia. 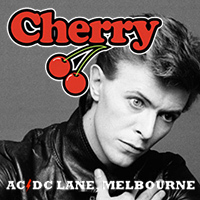 LAST CHERRY BAR BOWIE HURRAH! 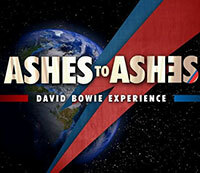 Ashes to Ashes: The David Bowie Experience plays The Wreckers Live in Goolwa, South Australia. 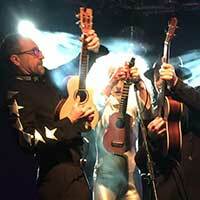 The Thin White Ukes will be delivering a concert at The Garden Spiegeltent as well as a uke workshop. JEFF DUFF and band play a free show in Thirroul. 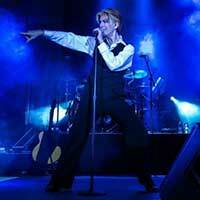 Ashes to Ashes: The David Bowie Experience plays Fedora's restaurant in the suburb of Hilton, Adelaide, SA. 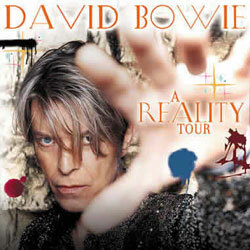 The down under leg of David Bowie's REALITY tour opened on this day 15 years ago. The concert took place at a massive outdoor venue - Westpac Trust Stadium in Wellington. JEFF DUFF plays Ulumbarra Theatre in Bendigo. JEFF DUFF plays The Flying Saucer Club in Moorabbin. JEFF DUFF plays The Gov in Adelaide. 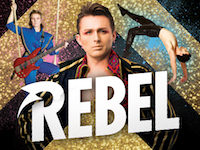 DAVID BOWIE's ethos for reinvention, presentation and stagecraft has served as inspiration to create REBEL - a live acrobatic circus that is set to live performances of his music. Choreographed, directed and produced by Melbourne’s Highwire Entertainment. 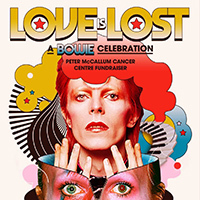 One of the world's most renowned Bowie tributes is coming across from the UK to NZ. Catch Adam Rudegeair (Lake Minnetonka, PBS fm's Black Wax) and his cohorts as they re-invent their favourites from Bowie's vast catalogue as intense and swinging instrumental jazz! 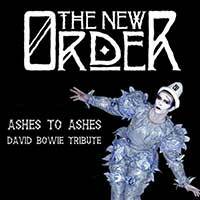 The New Order invites you to a celebration of the life and times of the man who fell to earth, David Bowie. 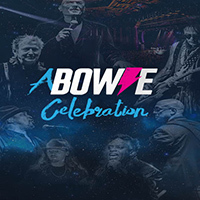 This very special event will journey through David Bowie’s works, collaborations and influences, as well as the usual spectacular array of goth and alternative music for your listening pleasure. 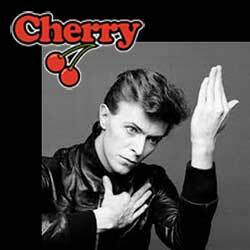 Cherry DJ’s will be spinning nothing but Bowie in the main room, covering all periods (Major Tom, Ziggy Stardust, Aladdin Sane, Thin White Duke, his return to pop in the ’80’s, late 90’s alt-rock leanings and self penned requiem that was Blackstar)! We’ll be slingin’ $10 Espresso Martinis and partying ’til 5AM! WHERE: Jacs Bar, 6 Main Street, Arkles Bay, Whangaparaoa Peninsula, Auckland. On this day three years ago, the world lost an artistic visionary and cultural icon - David Bowie. 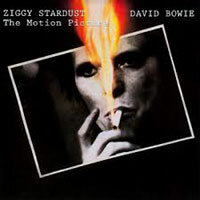 At 7:30 PM, Ziggy Stadust and The Spiders From Mars plays at The Astor Theatre. 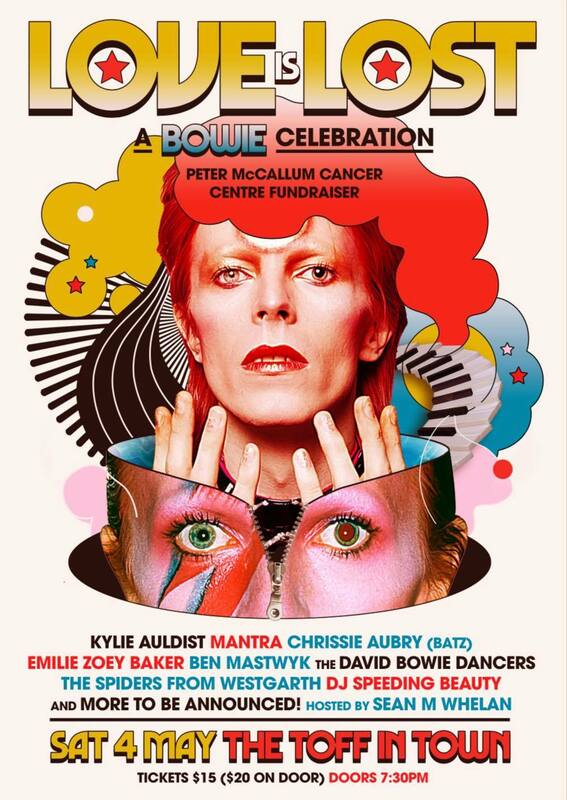 Boom Crash Opera's Dale Ryder, Taxiride's Jason Singh and Tim Watson and Electric Mary's Rusty have teamed up to deliver a musical extravaganza paying homage to David Bowie. 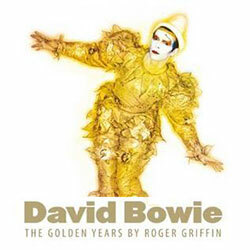 The inaugural BOWIE: GOLDEN YEARS show will be held on Thirsday 10 January, marking the 3rd anniversary of Bowie's passing. Back by a 5 piece band comprising some of Australia's premier musicians. JEFF DUFF plays The Camelott Lounge in Marrickville. This show marks the 3rd Anniversary of David Bowie's passing and his 72nd birthday. On a request from Bowie Downunder, The Sound and Vision Club will present BOWIE'S BIRTHDAY BASH at the amazing Loop Bar in the CBD. 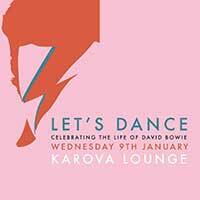 The venue will be playing Bowie hits, album tracks, obscurities and screening music videos. There will also be a special live performance from The Thin White Ukes!!! Tristan James (DJ Salinger) will be giving the Karova Lounge a lesson in the musical talents of the great man. 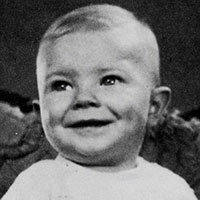 On this day in 1947, David Bowie was born in Brixton, London. His name at birth was David Robert Jones. In 2013, the date was signalled by a come back single 'Where Are We Now?') 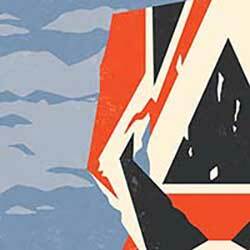 and the announcement of a long awaited and unexpected new album (The Next Day). 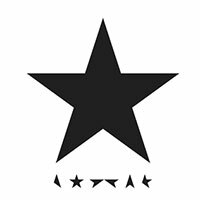 In 2016, the day was signalled again by the release of David Bowie's final album, Blackstar. 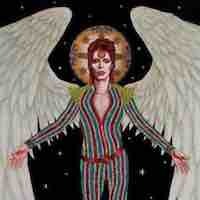 Bowie's Birthday Celebration at The Gaslight Tavern, Brompton S.A. A stripped back acoustic extravaganza. West Australian musicians will again take to the big stage to pay homage to the Starman with their own special Bowie interpretations. WHERE: Totara St, 11 Totara St, Mt Maunganui, Bay of Plenty. 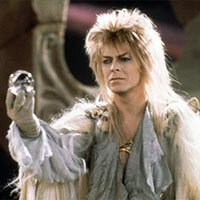 Labyrinth starring David Bowie plays at The Rooftop Cinema in the CBD. DJs Tina Turntables, Kailee Raven Debirred Matthew Crawley and Pennie Raven Black spin tunes from the Bowierepertoire and other such favourites to get you dancing. Dress in your finest and celebrate. 9pm until late FREE ENTRY! The brand new Duncan Jones MUTE is now showing on Netflix Australia. Bowie Downunder has a 'STATION TO STATION' railway concept for the future of Melbourne. There is a proposal by Bowie Downunder to open a David Bowie themed garden in time for the great Sydney solar eclipse. Adam Rudegeair's second volume of jazz interpretations of David Bowie tunes - "It's Always Time" is released! 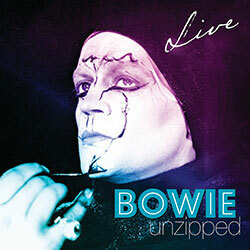 Debut live album by Bowie Unzipped (featuring Jeff Duff). 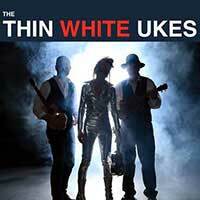 Debut studio album by Melbourne based David Bowie covers band, The Thin White Ukes. 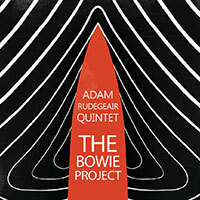 The studio album of Adam Rudegeair Quintet's jazz interpretations of David Bowie tunes. 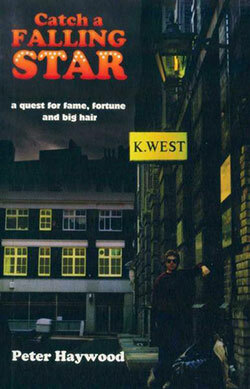 A paperback/hardback by Sydney author Roger Griffin. 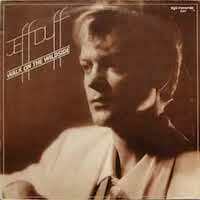 The release of This Will Explain Everything, the autobiography of Jeff Duff. 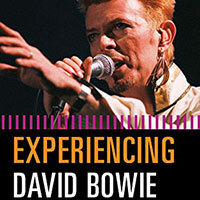 The tome is dedicated to Bowie who features heavily in the pages of the book and Jeff's life. 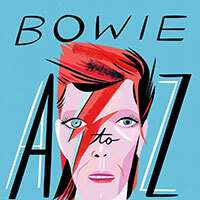 The release of Bowie A to Z, a new hardback written and by Australian author and comedian Steve Wide. Illustrated by Libby VanderPloe. A book from New Zealand author and academic, Ian Chapman. A paperback from Australian author and academic Toija Cinque. 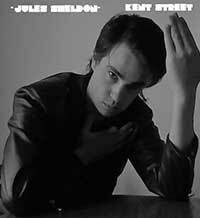 A novel from Australian author and Bpwie Downunder member Peter Haywood.